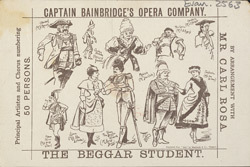 This leaflet is advertising Captain Bainbridge's Opera Company. The increase in leisure time and the availability of disposable income helped to increase the popularity of all forms of theatrical entertainment. Many Victorians enjoyed opera in the 19th century. Operas like those by Gilbert & Sullivan or like Captain Bainbridge's Opera, were very fashionable. Costumes were extravagant, sets were colourful and stage personalities were flamboyant.